As we explore the architecture of the west coast of America, from Palm Springs to San Diego, from San Francisco to Los Angeles we ask ourselves, why have these buildings stood the test of time? What is it about them that they have continued to outlive us? As you enter the incredible ancillary spaces at the Embarcadero Center, you are greeted by a spiral ramp which winds its way up through the building to an open roof at the top. The void spaces left behind, between the immense concrete forms were stunning, bouncing light from above and water reflection from below it was magic. The artistic nature of the St. Mary’s Cathedral evokes a union between heaven and earth through the balanced simplicity that becomes possible through modern engineering. The curved roofs create a graceful flow upwards until it reaches 190 feet where the four corners meet in a cross. 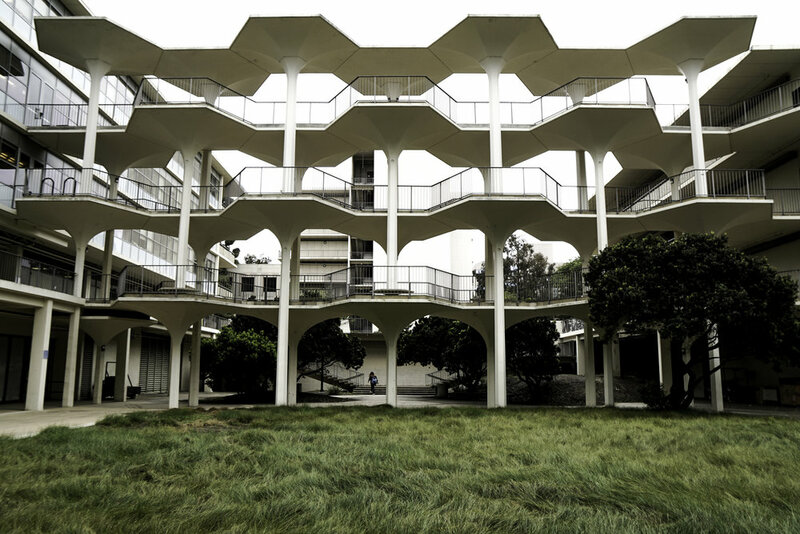 San Diego with its miles and miles of white beaches has some of the beautiful mid-century gems, these buildings have been cherished and have some of the homes that made the west coast a modernist mecca. The breezeway could so easily have been a cheap, utilitarian bridge, but instead, they designed and built this elegant structure that is a joy to behold and to traverse in all weather. Working in unison; the colours, light and shadows provide a view beautiful to look at from all aspects. The Case Study houses were a fantastic exploration of housing that genuinely pushed the conventions of what a home was of the time. This building can be described as the ‘Taj Mahal of Brutalism’, and it does not disappoint an avid lover of the movement. Nothing could quite prepare you for standing at the top of the travertine courtyard looking through the treeless space towards the ocean vista that opens at the end. There is nothing but concrete, timber, glass, water and sky. The Venice beach house designed with the idea of individual pods, each with a corresponding outdoor space. The Venice house is not connected in the way traditional dwellings are; with corridors and walls but by letting the outdoors in; To move between the central living space you have to walk through beautifully landscaped courtyards. Upon entering the house from the street you are greeted with a blackened timber screen that allows a glimpse through into the first courtyard space. You are directed to traverse a series of areas that get darker and quieter before you are expelled out into a calming courtyard space with a huge tree towering over. The Californian desert city, palm springs boasts one of the best collections of modernist architecture in the world. Significantly expanding following World War II, when a movement of optimism inspired creative people in many fields. Architects in Palm Springs were eager to innovate and work in the modern approach, liberated from the usual design restrictions as well as the pressure and specific demands that a primary residence required of the time. Architects took full advantage of the leeway granted them. In clusters around the city are the Palm Spring tract homes, built in 1956 - 1959, which are essentially what we would call project homes, done as a development. All homes had an architect involved which is a true testament to why these homes have outlived many. The Alexander Homes explored scale and a restrained material palette which come together to let the life that happens within and around them be the showcase. Guard House at Desert Palisades (a planned gated community in Palm Springs).- Designed by architect Sean Lockyer 2016. A new addition and planned gated community in Palm Springs, the guard house is a representation of the calibre of the homes that will be within. The materials were chosen to complement the desert environment, and the aesthetic was to reflect both the nature and thrusting of the hillside slopes surrounding. You can not get more quintessentially Palm Springs than this, with the palm trees, the mountain range in the background, the Krisel designed house and the vintage car! The buildings and homes we explored on our trip were designed and built at a time of great optimism. They were designed not to maximise floor area, or to be easily built, or to last only 20 years or so like buildings now; they were designed to stand the test of time, to be beacons of architecture for a lifetime. The materials were hardy, like concrete, steel and glass, and they took craftsmen to build. And while many have fallen in and out of favour with people in general, those that survive will always return to be valued for what they are, true modernist design at its finest.